Welcome to part 1 of our CRM for Sales Series. For part 2 click here. Early February, John Cheney – CEO at Workbooks hosted a webinar to discuss and share lessons learnt on growing sales revenues using CRM. See below a summary of the key takeaways for you or access the webinar download. Such framework provides multiple benefits including providing a common language to allow team members can rapidly understand where they are in the Sales Cycle allowing the business to measure success at each stage & identify where to drive improvements. Include both Marketing and Sales in the process – They are both part of your demand funnel and need to work together for success. Jane is a new team member but has a strong hit rate…A future star? Dylan has a low conversion rate. A red flag. 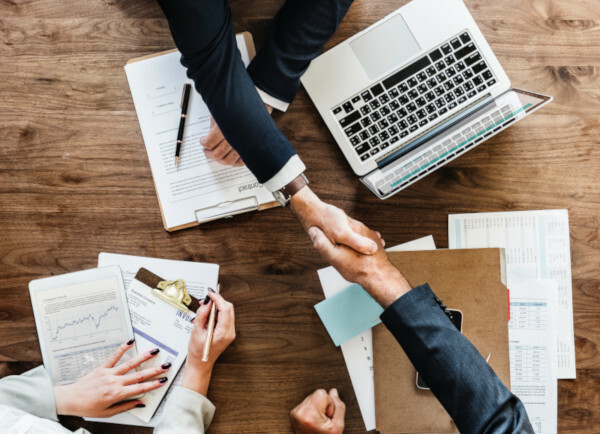 As you can see once you’ve got your data into your CRM and assign it within a well thought-out sales process, you can then pull some actionable data. In combination with Sales Pipeline information, we encourage you to look at what Sales Reps are actually doing. 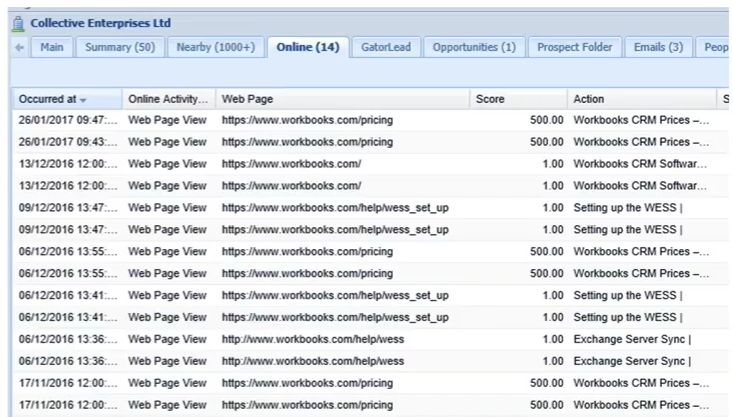 On the right-hand side you can see the number of activities against each Sales Rep. This is showing that Dylan isn’t making much progress and has a number of outstanding to-dos. So what insights do you now have? 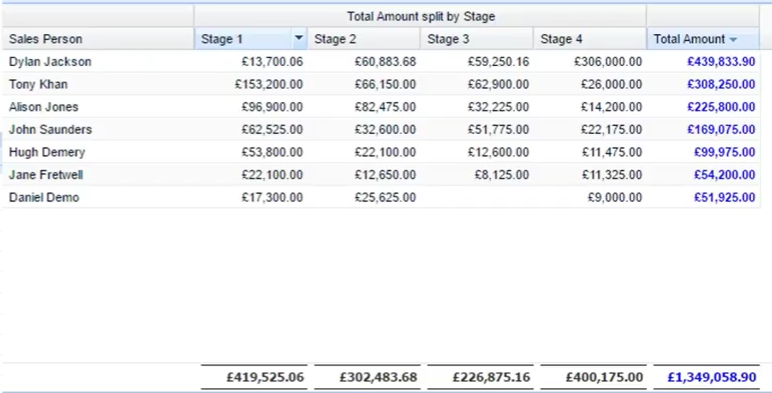 You need at least £1.5m in qualified pipeline to reach your £500k target (based on your conversion rate of 1 in 3). 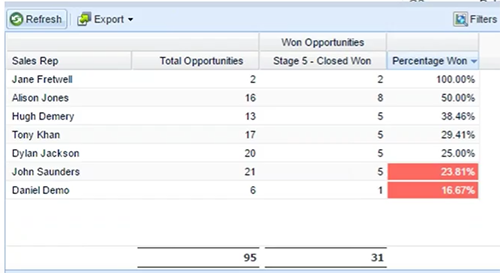 On the right side, you can see our total pipeline by Sales Rep report. You have £1.3m in the pipeline but most of it is sitting with Dylan; considering what you know about his performance to date, it might be time to move some of the pipeline to another rep or work more closely with him to ensure those opportunities are managed properly. Since you need 150 leads a month you should define exactly what you consider an MQL (Marketing Qualified Lead) e.g. location, size or industry. This will help Marketing bring in not just leads but the ones that are more likely to convert to customers. Now you have an MQL definition we recommend setting Marketing an MQL target and a Sales Accepted target (converted MQL’s with a monetary value which has been accepted by field sales). We also recommend capping deals to avoid skewing pipeline metrics with just one big opportunity. By feeding back why deals were lost (prospect spent money but not with you) or qualified out (the opportunity wasn’t the right shape or size or the prospect wasn’t ready to buy) and categorising the reason e.g. Product feature, poor sales execution or price, you can begin to spot trends to refine their activities. One of the first common resistance points with a CRM project comes from sales people who do not realise the value of CRM. Since your CRM is worthless without any up-to-date data, how can you ensure your Sales members use it? The answer is: your CRM tool must help Sales People in their day-to-day. It must guide them on what to do next and what actions they need to complete in order to progress an opportunity to the next stage. It must make their life easier. Savinh them time, removing or reducimg the admin. If it’s just used for storing data there will be no major benefit and adoption will suffer. As a Sales rep, how can I get tangible benefits from CRM? Using a website integration, you could see who is currently on your site – allowing you to spot for example previously qualified out deals who may be interested again (see right-side image for an example). Which customer reference can I use? By tracking references within our CRM you can auto pull this into opportunities, allowing you to rapidly find related references (filter by industry, size, country etc). By embedding sales best practice inside your CRM (such as the BANTS framework for example), you can ensure the right questions are asked, the right action is triggered at the right time in the sales cycle. CRM plays a vital role in supporting sales excellence. CRM can provide a framework to ensure the right processes are being followed. It also acts as a channel to feedback essential insight to the business to support on-going sales activity. CRM can provide access to information to mobile sales reps anytime, anywhere via mobile apps or tables, CRM can automate repetivie tasks and remove the administrative burden so that reps can focus on building relationships and selling. CRM can record sales activities to ensure that opportunities are progressed effectively and no calls are overlooked. CRM can help organisations analyse key metrics and evolve its strategy in response. 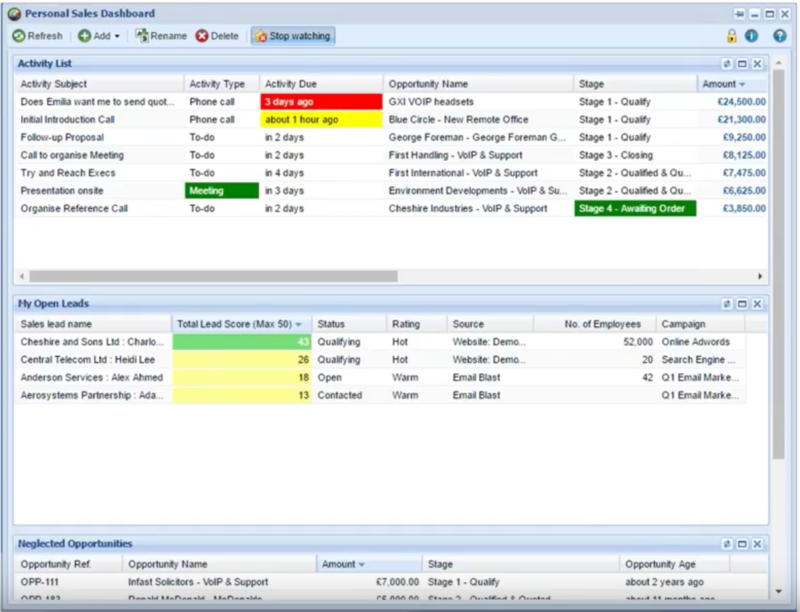 CRM enables sales teams, from management to individual reps, to work more effectivley. It helps get better insight and make better decisions, it helps to better identify opportunities, close more deals and grow revenue.